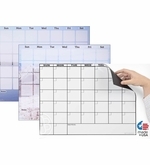 OptiMA roll up dry erase calendar magnets are a printed magnetic sheet with an outstanding dry erase writing surface that will stick to any clean, smooth steel surface. 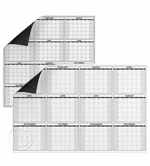 Printed dry erase roll up magnets that can be rolled out and stuck to just about steel surface or magnetic receptive dry erase board or chalkboard. A super convenient way to keep your schedule in plain sight. 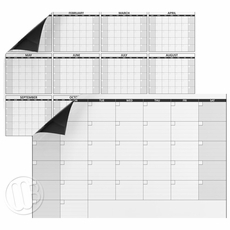 As with any OptiMA printed dry erase surface, if you don't see a calendar design that suits your needs, simply contact customer service and we can print up what ever you need. 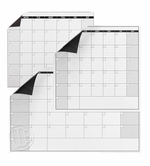 All of our roll up dry erase calendars are made in the U.S.A. with domestic and imported parts. Helpful Hint: The exclusive OptiMA dry erase writing surface accepts either damp erase or dry erase markers. Damp erase markers require a damp cloth to erase them while a dry erase marker will wipe clean with any soft cloth. Using damp erase markers may be a safer alternative to dry erase markers if you don't want your calendar erased by accident.